Intel is touting their latest 5G message with the usual lack of anything substantial. Today they told SemiAccurate about their upcoming, 2H/2019, 5G connected PC and a few other things. You might have noticed we are down on Intel’s LTE and 5G efforts mainly because they promise the moon and deliver significantly less. The latest announcement is that they will have a connected 5G PC, basically a 2-in-1 with an 8000-series modem on board. This sounds good but there are a few things to bear in mind before you get all excited about the idea. Lets take a look at them. It;s real, just ask, see? Starting out with the fact that the Intel 8000-series 5G modem has not been shown or demonstrated anywhere, period. Their ‘release’ of the ‘product’ was accompanied by the badly photoshopped image above, Intel likely doesn’t have the silicon they are ‘releasing’ much less have it working. That said they are going to ‘show’ a ‘sneak peek’ of it at MWC, very likely without divulging what silicon is in the box. Then there is the second huge problem, standards. You might have noticed Intel’s $200M campaign about 5G at the Olympics which ties into this announcement. Once you dig into the details you realize that Intel is quite literally years behind Qualcomm and others on 5G. Why? The standard for 5G is called 5GNR or 5G New Radio. 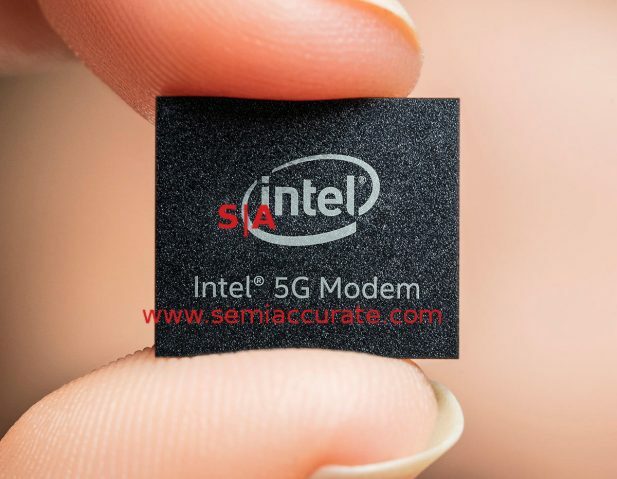 Intel has made lots of noise about their 5G accomplishments but they never say 5GNR because they can’t actually meet the 5G spec. This is more than a semantics issue. While Qualcomm has had 5G handset form factor devices out for about a year, SemiAccurate has held quite a few, Intel’s Olympic ‘5G’ radios come in a bus form factor. No really we are not joking, they are bus mounted and the devices are kept hidden. Buses are not a convenient phone form factor, nor are non-standards compliant 5G radios, buses or not, very useful. Intel did not say their MWC concept was 5GNR compliant likely because they can’t. SemiAccurate would have asked more questions about this but Intel has been in the habit of releasing ‘news’ the evening before release which doesn’t allow for actual questions to be asked. Read into that what you will. More important is the fact that 5G is based on 4G/LTE with a constant 4G connection to prevent the fallback problems that crippled voice/VoLTE during the 3G/4G transition. This is the long way of saying you need GbLTE as a base to run 5G. Intel can’t do GbLTE, they promised Apple GbLTE years ago and delivered… well current iPhones run at 600Mbps. Qualcomm has had GbLTE deployed in the field, live for customers, for over a year now. Again, draw your own conclusions. There are two other announcements from Intel at MWC that are quite realistic, 802.11ax and eSIMs. Both of these will be shown off at MWC and both are likely to be productized in the near future. Intel has a long history of 802.11 chips so we feel their 802.11ax will be both ubiquitous and adequate or better. eSIMs are again not a big trick if you have a secure enclave on your device, you essentially store the credentials for a SIM on it. *COUGH*. Intel has yet to demonstrate they are taking security seriously.